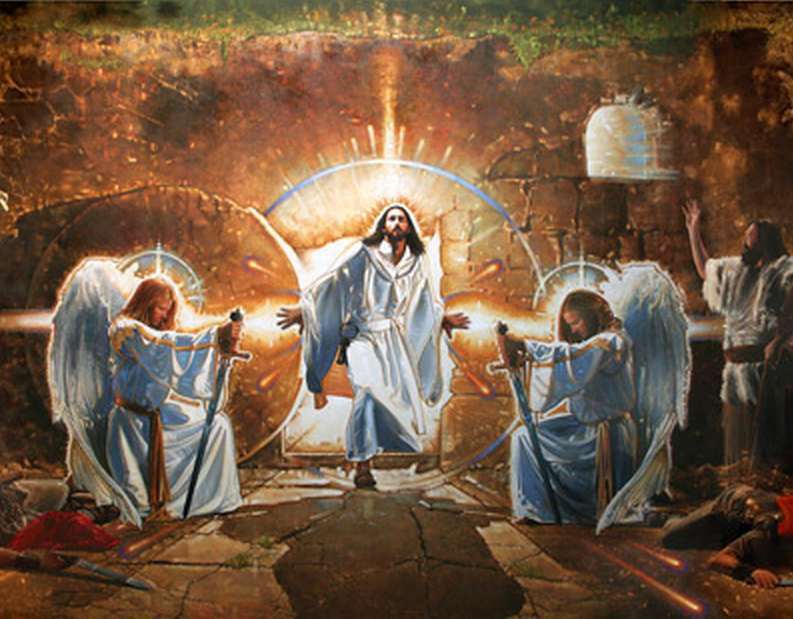 Jesus has conquered death and the grave, HALLELUJAH! Jesus is the Alpha and the Omega! Colossians 1:13-18 He has delivered us from the power of darkness and conveyed us into the kingdom of the Son of His love, in whom we have redemption through His blood, the forgiveness of sins. He is the image of the invisible God, the firstborn over all creation. For by Him all things were created that are in heaven and that are on earth, visible and invisible, whether thrones or dominions or principalities or powers. All things were created through Him and for Him. And He is before all things, and in Him all things consist. And He is the head of the body, the church, who is the beginning, the firstborn from the dead, that in all things He may have the preeminence. This 1970s Easter song by Second Chapter of Acts is as joyful and inspiring as ever! You can hear it at this link. This weekend I went on a two-day men's retreat to Bardsey Island, just off the southwestern tip of the Llyn Peninsula in North Wales. 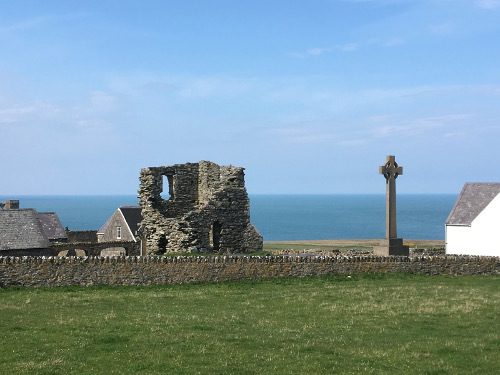 The island had its beginnings as a place of solitude, prayer, and pilgrimage in the 6th-century when the Celtic monk Cadfan built a monastery with his fellow monks. These are remains of a 13th-century Augustinian abbey. 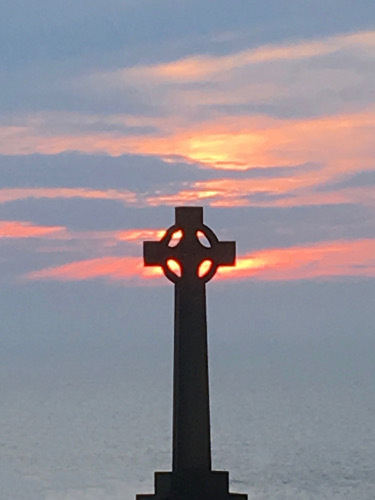 Almost as soon I set foot on the island, I was struck by a sense of God's presence and a reverence for the those who had sacrificially given themselves to a difficult life of simplicity and seeking God. It was a wonderful experience just to be in this place that has drawn my interest for years. On Saturday afternoon I climbed up to the top of the 548 foot tall Mynydd Enlli, or Bardsey Mountain. As soon as I could see over the ridge towards the east, all of Wales stretched out before me from left to right. Although the view in the distance was obscured by the haze, I had the sensation that I could reach out with the arms of God and embrace the whole this beloved land in the same way Jesus said in Luke 13:34, "Jerusalem, Jerusalem, ...how often I have longed to gather your children together, as a hen gathers her chicks under her wings, and you were not willing." I sat down and found myself immediately overwhelmed. It seemed I was directly connected with the prayers of the saints of centuries gone by, and, spontaneously, I recorded my thoughts and prayers. "And Lord, our prayer, our cry oh God, is that these people would be brought out of the night into the dayspring of life. Jesus, that Your Holy Spirit would reach down through the generations of prayers and longings and desires for the only eternal destiny that has any merit. Lord, that you would tear off the veil that covers the nations, the veil of secularism, and blindness to the fact that we are more than just flesh and bone. Lord, as in Ezekiel 37 speaks out over the valley of dry bones, Lord would you let these dry bones live again. "God our cry is for these bones, these living bones, to find real life. That they would not live in "shadowland" for generation upon generation as they've done for so many centuries now. And God we cry, we pour out our hearts, we join our hearts to the cries of the saints down the ages. Lord, that they would know you, the only true God, and Jesus Christ whom you have sent. "Jesus, we join our hearts with those from around the world, long since gone on to their heavenly reward, Lord, that their prayers resound around heaven as do ours. And we say, Come Lord Jesus. Pour out your mercy and your grace. Pour out revelation, pour out conviction of sin, pour out revelation of judgement, righteousness, and truth. Thank you Jesus."